A window container. This container adds functionality for more convenient widget (windows in particular) destruction. Definition at line 34 of file windowcontainer.h. Definition at line 68 of file windowcontainer.h. List of widgets that are scheduled to be deleted. Definition at line 67 of file windowcontainer.h. Definition at line 35 of file windowcontainer.cpp. Ensures that all visible windows are on the screen after the screen has been resized. Definition at line 66 of file windowcontainer.cpp. Definition at line 76 of file windowcontainer.cpp. 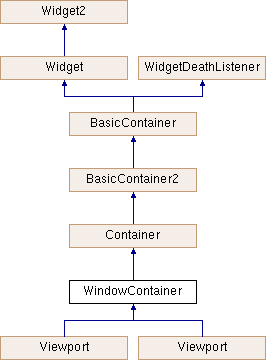 References BLOCK_END, BLOCK_START, BasicContainer2::draw(), AttributesEnum::find(), BasicContainer::mLogicWidgets, and BasicContainer::mWidgets. Schedule a widget for deletion. It will be deleted at the start of the next logic update. Definition at line 49 of file windowcontainer.cpp. References mDeathList, mDeathSet, and reportAlways. Referenced by WhisperTab::handleCommand(), ChannelTab::handleCommand(), Popup::scheduleDelete(), and Window::scheduleDelete(). Definition at line 42 of file windowcontainer.cpp. References delete_all(), mDeathList, and mDeathSet. Referenced by Client::gameClear(), Client::initConfigListeners(), Gui::slowLogic(), and Gui::~Gui(). Definition at line 69 of file windowcontainer.h. Referenced by scheduleDelete(), and slowLogic(). Definition at line 70 of file windowcontainer.h.